* 3 Night Special Getaway Dinner Package: A reservation for 3 Nights will include one complimentary Dinner Voucher for a choice of Restaurants down at the Falls. Plus discounts for Wineries & local Attractions. * You will love the Large 4 Poster King size Bed which is the new addition in the larger room of the 2 Bedroom / 2 Bathroom Family Suite. * The Niagara Parks has a New Zipline & Aerial Adventure Course. You can either take the WEGO Shuttle Bus or Walk to this attraction from my B&B. Andrea's Niagara Falls Bed and Breakfast offers Special Packages all year. Come indulge yourself in a Romantic Getaway vacation at the historic Andrea's B&B. Make sure you ask about my Monthly Specials. 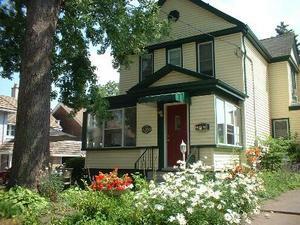 A quaint bed and breakfast built in 1892, located in the older, quieter Downtown area of Niagara Falls. I followed my dream and established this historic home into a B&B in 1987. ( I live in a separate section of the house, so that you have plenty of privacy in a nice safe haven ). I can highly recommend Carriage rides through the Botanical Gardens, Winery Tours plus tickets to our local Theatres to enhance your visit to Niagara Falls. Enjoy a 20 minute walk to the Falls or ride the WEGO Shuttle Bus near my B&B. Have a Romantic Evening in my 2 Bedroom / 2 Bathroom Family Suite which includes total privacy for two couples or a family of 4. The Larger room has a King Bed, Ensuite Bathroom with Tub / Shower, sitting area with Gas Fireplace, Ceiling fan, Cable T.V, Fridge, Microwave, Air conditioner, Private Entrance and Deck. The smaller room has a Queen Bed, Cable T.V., Antigue Dresser, chair, Ceiling fan, hot water heating, Air conditioner and large Ensuite Bathroom with Shower. I am able to accommodate up to 8 people when you reserve the Suite plus the Antique Double & Antique Queen Bedrooms all with private bath, Air Conditioning, Ceiling Fans, Cable T.V. Enjoy a different Breakfast buffet each morning while you relax in the luminous Front Porch, garden patio in the summer or in the dining area by the warm and toasty gas fireplace in the winter months. So come and treat yourself to a pleasant stay at our welcoming B&B! * Free Parking, Air Conditioning, Ceiling Fans, Private Bath, Free Breakfast, Smoke Free, Fridge, Kettle, Microwave, Complimentary Tea / Coffee, Free WiFi, Cable T.V., Children are welcome. *I can also make arrangements for a Relaxation Massage, Wine Tour, Horse & Carriage Ride, Free Shuttle Service to Casa Mia Ristorante. Wake up to the Aroma of Fresh Coffee. Enjoy a delicious Full Breakfast Buffet set for you from 8:00 am with the last seating at 9:30 am. (we serve either of the items below) Egg Dishes, Pancakes, Waffles, Quiche, French Toast, Fresh Baked Goods, 9 Grain Bread, Fresh Fruit, Cereals, Vegetarian, Gluten free, Yogurt, Milk, Juice, Tea & Coffee. * Guest Fridge, microwave, toaster, Kettle, coffee maker, complimentary Tea & coffee. Relax in our enclosed Front Porch or outside Garden Patio in the summer or by the fireplace in the dining area in the winter. * I serve Breakfast in the privacy of your Honeymoon Suite, so you can relax in front of the Fireplace or sit out on your Private deck and enjoy the view of the Niagara Gorge. Private Deck of the Suite.